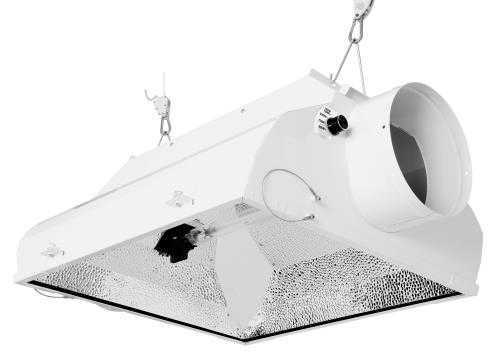 This complete fixture includes a built-in high frequency 105 kHz Sun® brand ballast made specifically for running double-ended horticultural lamps. The patented sealed optic technology allows removal of heat generated by the lamp without cooling the DE lamp itself. The Fusion can operate a 1000 watt DE lamp at 600, 750, 1000, and 1100 watts. Features German made, UL listed double-ended sockets. 95% reflective textured German aluminum interior with 98% reflective corner inserts offer excellent uniformity, output and diffusion. Galvanized steel housing with durable powder coated finish. Manufactured with exacting standards and double neoprene gaskets for an air tight seal. Hinged glass makes changing lamps and cleaning glass easy. Operates on 120-240 volt. Includes a 20 ft 120 V power cord. Purchase a 240 V power cord separately (#903084). Comes with built-in level for easy, consistent, level hanging. In the rare event of ballast board failure, the Sun® brand PCB ballast can be easily switched out with a quick disconnect harness and repaired on site by the user. PLEASE NOTE - this unit requires active inline fan cooling when illuminated. Failure to use inline fan cooling may result in reduced performance and/or ballast failure. The patented Sun® brand PCB ballast has auto dimming thermal protection to prevent damage to the ballast in the event of fan failure.US Patents: D737498, D726116, D698628, D755722, 9335038, 9016907. US Patents Pending: 14/701134, 29/550672, 29/550597, 29/558123. Foreign Patents Pending: 14825888.2 (Europe), ZL201530400236.X (China), 2014290774 (Australia), 16111238.1 (Hong Kong), 2918776 (Canada).